There were a few sniggers when Porsche said it was going to build an SUV, but it turned out to be a fantastic business move. If we’re being honest we would be happier if sports car manufacturers didn’t have to build 4x4s just to make the numbers stack up, but the Cayenne does give Porsche a chance to experiment with electric drive without offending the 911 mafia (for now). Things move quickly in Stutggart so Porsche is already onto the second variant of Cayenne Hybrid with some choice upgrades. 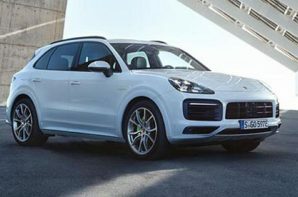 The Cayenne lends itself to electrification as it has a big footprint and a hefty kerb weight which both make it easier to integrate the extra kit without a major redesign. In this case that means a newly enlarged 14.1 kWh battery pack living under the boot floor which reduces boot space from 745 litres to 645 litres and an 75 litre rather than 90 litre fuel tank. Whilst battery capacity is up 30% the volume of the battery is the same which when combined with the restyled body has resulted in more boot space than before. Fully charged it is capable of 28 miles (up from 23 miles previously) of pure electric running at up to 84 mph, but Porsche state a real world range of between 14 – 28 miles. With 2.5 tonnes to move around and a drag coefficient of 0.34 (again a slight improvement), there are no prizes for guessing that this isn’t the most efficient electric car ever, but if you can get towards the top end of the EV range, it does have low CO2 emissions. The petrol bit of the equation is a 3-litre V6 with a supercharger which kicks out 335 bhp all on its own and with a little help from the electric motor, total output is a healthy 456 bhp. This is aided by a significantly upgraded motor which can now produce 136 bhp which is a 43% improvement. This is sufficient to provide a 5 second 0-62 mph time which is plenty fast enough. All of that power is channelled through a new 8 speed Tiptronic S gearbox to all four wheels via an active all wheel drive system. You also get no less than 4 driver modes to play with which includes a Sport Plus setting which has an extra quick battery recharge function which provides maximum performance. At the more sensible end of the spectrum is E-Power and Hybrid Auto. The Cayenne always starts in pure electric E-Power mode but selecting Hybrid Auto not only brings the petrol engine into play but allows intelligent control of the powertrain based on driving profile, charge status, topology, speed and when a destination is programmed into the Sat Nav, distance too. It is clever stuff and ensures that the battery and petrol portions are used as efficiently as possible. The Cayenne is priced head on with the equivalent diesel models and has very similar performance too. However it has a substantially lower tax rating and if you can utilise the electric range it offers big fuel savings too. The updated model is more practical, more efficient, and in Sport + more performance oriented too and now has a long enough electric range to cover most everyday journeys. As usual with plug-in hybrids our advice is to buy this model if you regularly drive within the EV range, and look elsewhere if you don’t, as petrol-only running will result in heavy fuel consumption. You have been warned!